The international toy company, Wild Republic, today announced that it has hugs for everyone this year. The world will be embraced by Wild Republic’s new Huggers with the introduction of the new plush line at the International Toy Fair held in New York City this week. According to the Wild Republic, the Huggers are the most huggable plush because they hug you too. The Huggers (MSRP $8) spread the arms wide open and when you give the belly a squeeze… SNAP… the long plush arms instantly wrap around and give you a hug. Huggers are great for hugs onto your wrist, a backpack, stroller and so much more. Also at Toy Fair, Wild Republic will introduce its Sassy Scents and Wild & Wonky plush lines. 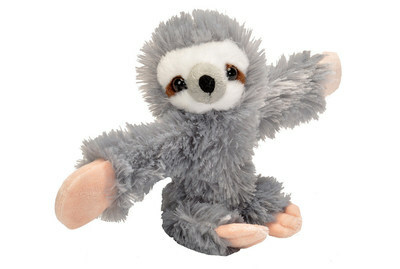 Sassy Scents (MSRP $8) are adorable little stuffed animals that are fruit scented to match their color. New, high-quality, extra soft fabrics and large, glitter-rimmed eyes add to the appeal of the fun new plush pals. Choose from fan favorites: Strawberry Elephant, Grape Penguin, Blueberry Wolf, Cherry Red Panda, Tangerine Tiger, and Raspberry Snow Leopard. Wild & Wonky (MSRP $8) are untamed, a little bit quirky, and each comes with its own name and profile. Like Edwin Sloth, discovered in the gothic rainforests of Costa Rica. This talented fellow showed promise as a hairstylist until airport security made him clip his claws on his way to Hollywood. Wild & Wonky are a fun, refreshing, delightfully collectible line of plush toys from the Wild Republic! About Wild Republic: Wild Republic has been delighting consumers around the globe with an expansive collection of nature-related toys and gifts since 1979. Headquartered in Twinsburg, Ohio, Wild Republic has offices throughout the world with international distribution serving zoos, museums, aquariums and retailers. Consumers can also purchase directly at www.wildrepublic.com and are invited to follow the company on Facebook. The information on this page is provided by PR Newswire. All rights reserved. Reproduction or redistribution of this content without prior written consent from PR Newswire is strictly prohibited. PR Newswire is not responsible for this content. Learn more about this service.